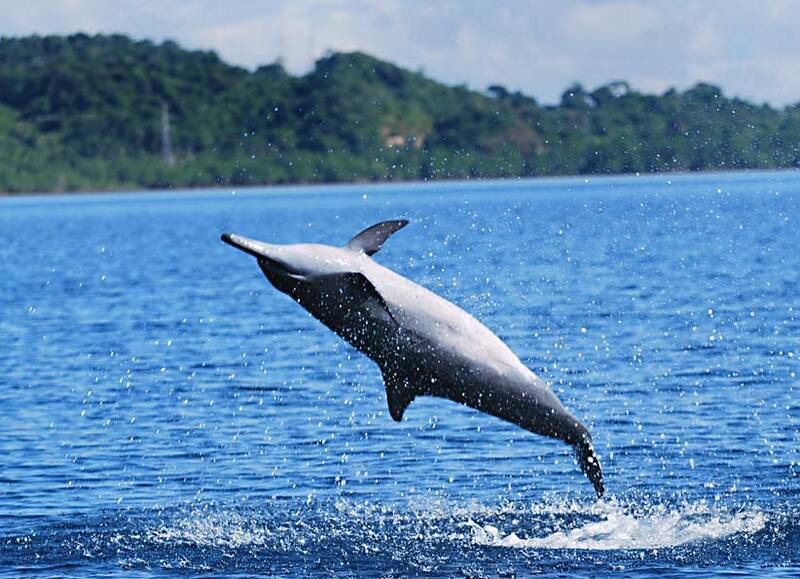 A spinner dolphin beside our bangka. For years now, since moving to Puerto Princesa, Palawan, I have heard that the dolphin watching was quite an experience. We never went out on the bay until a few weeks ago when Dave bought his own bangka and parked it in Turtle Bay, just 1 km. in back of where we live. 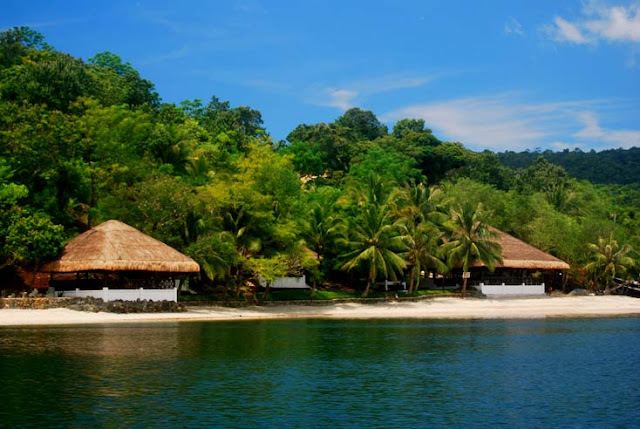 When we first got here, everyone was going on and on about the Puerto Princesa Underground River. Which we have now seen thrice! It is truly amazing. 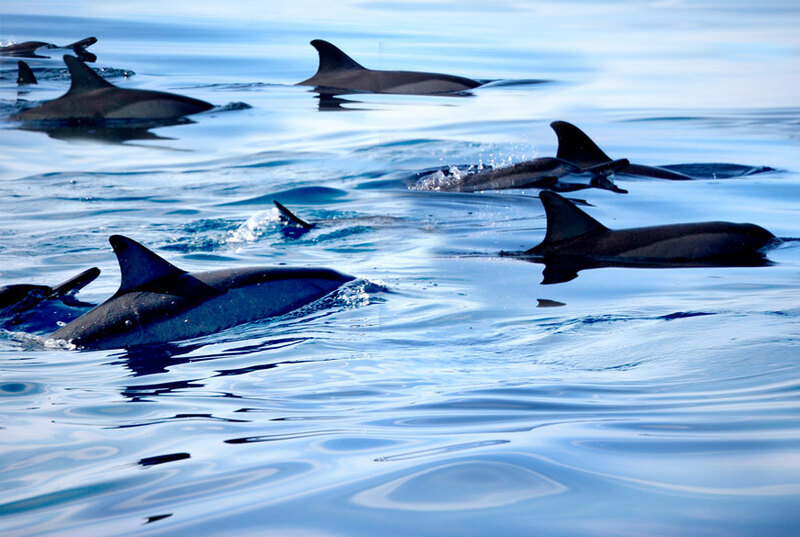 Yet for me, nothing compares to the feeling of being surrounded by all these spinner dolphins, so close we could almost touch them. The first time we went out, we came upon them within 15 minutes of setting out! Then my camera battery died!!! The second time we brought a friend and her son, but the waves were pretty high and we only caught a glimpse of a large school in the distance before it was time to get back to shore. 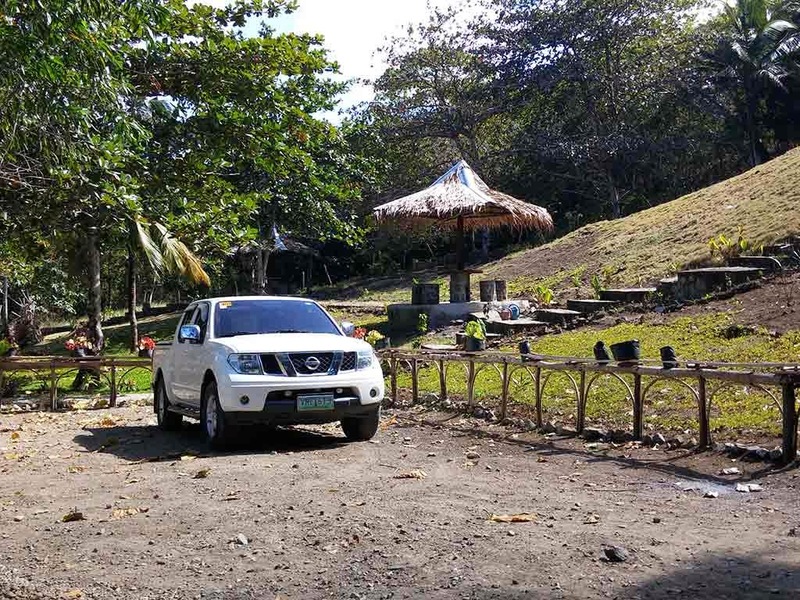 This last time, the day before my 64th birthday, we went out and got to the spot at around 8am. 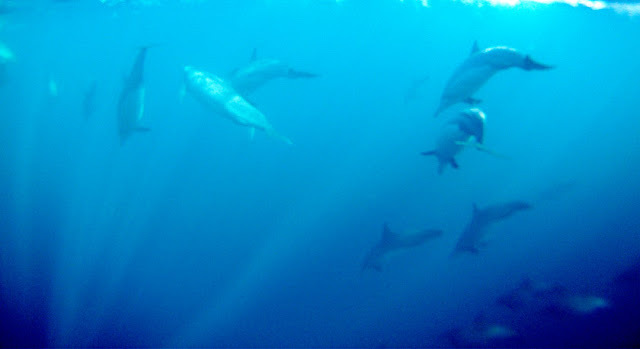 Lo and behold, dolphins to the right, then to the left and pretty soon spinner dolphins were everywhere we looked! 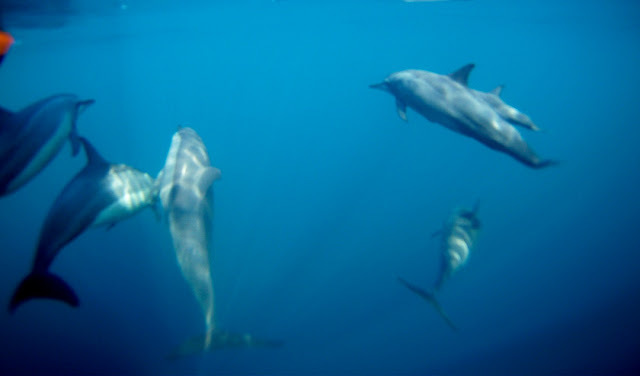 I think it was the most amazing, wonderful and magical experience of my life and I will never forget this day with the dolphins. We had several children with us and they screamed and cheered. 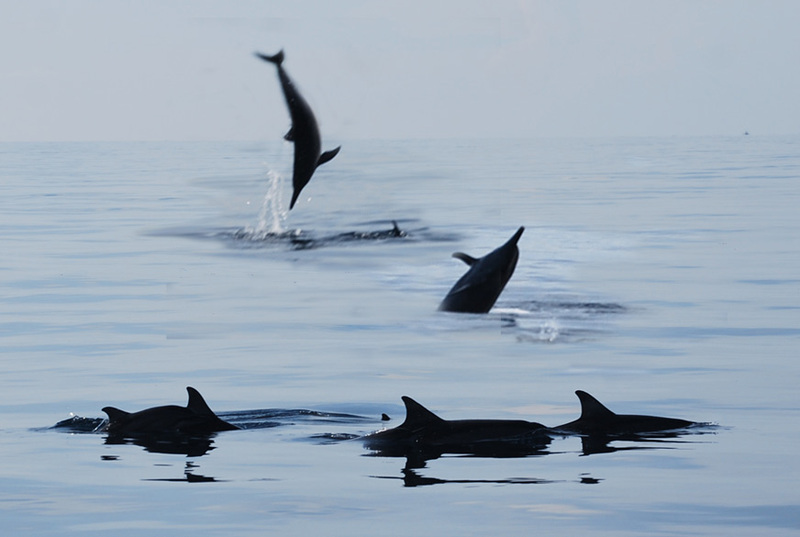 The more they cheered, the more dolphins would appear and do their acrobatics! Apparently up to 200 individual dolphins can comprise one school! 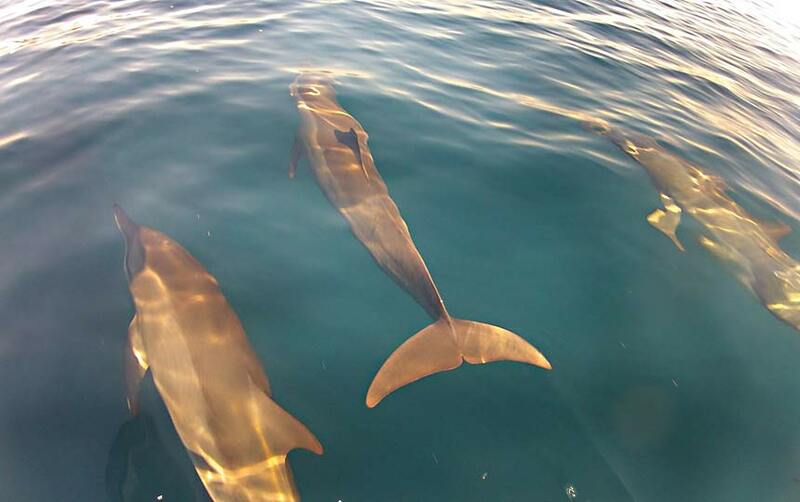 These spinner dolphins swam around, under and beside our bangka! One could almost touch them. (Not allowed though.) Their only reward was our screams of absolute glee. Feeding the dolphins is not allowed. 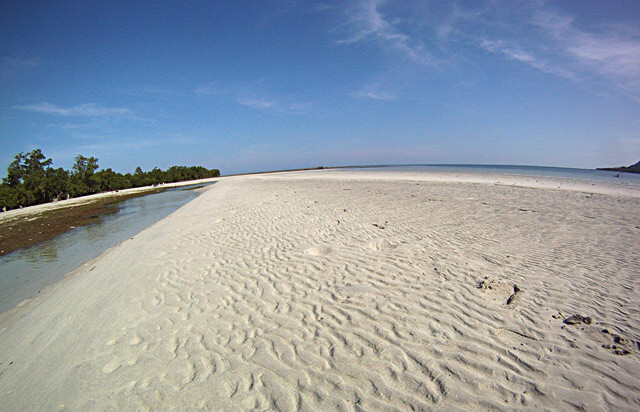 This was taken Sept 7, 2012 - Shot with a GoPro Hero2 cam, in waterproof housing, hand held and basically point and shoot in almost any direction. 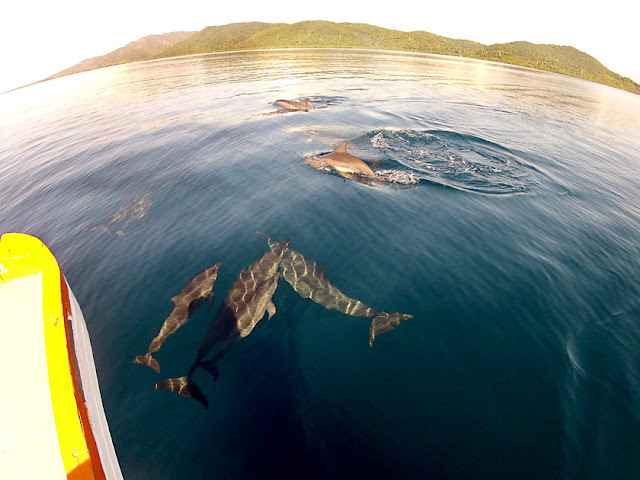 They were ahead, beside, underneath, chasing and crisscrossing the bow of the boat as we moved. With the GoPro, I had to be quick to get the action all around me. At one point I after I'd shot enough, I put the camera down so I could just inhale, and take in the experience. All the shots except the dolphin jumping we shot with 2 GoPro Hero cams. One in the water and one above. 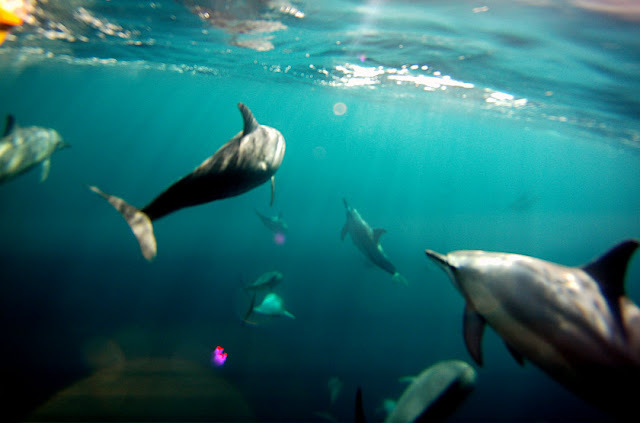 Sept.7, 2012 - shot with a GoPro Hero Camera in a waterproof housing. 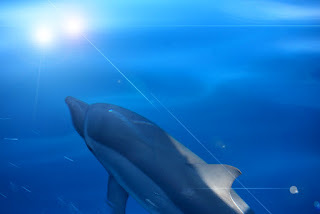 Sept. 7, 2012 - A spinner dolphin spinning...imagine that! 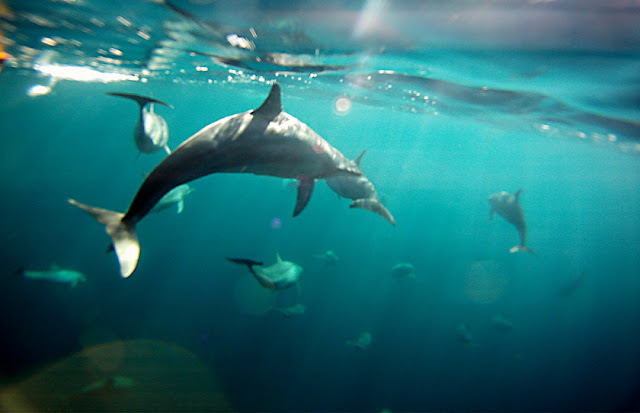 Sept. 7, 2012 - Shot above water with a GoPro Hero Cam in a waterproof housing from the bow of the bangka. This is a mother dolphin with her youngster! 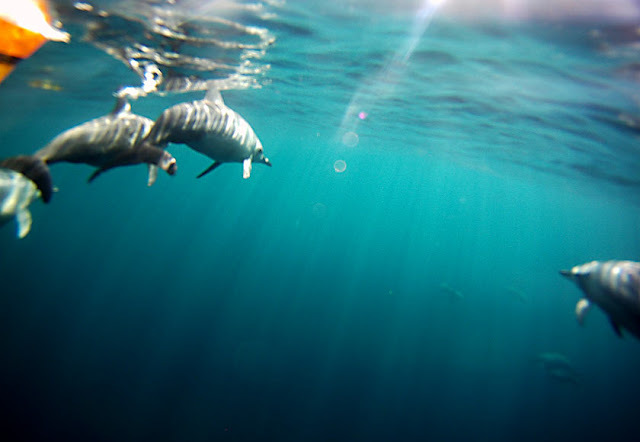 Taken with a GoPro2 Hero cam mounted on a metal pipe and set to take shots every second the placed underwater as the dolphins neared.. It shows what we couldn't see from above, that there were even more dolphins than we thought. If you ever do see them on a tour, please don't feed the dolphins. We like our dolphins wild! 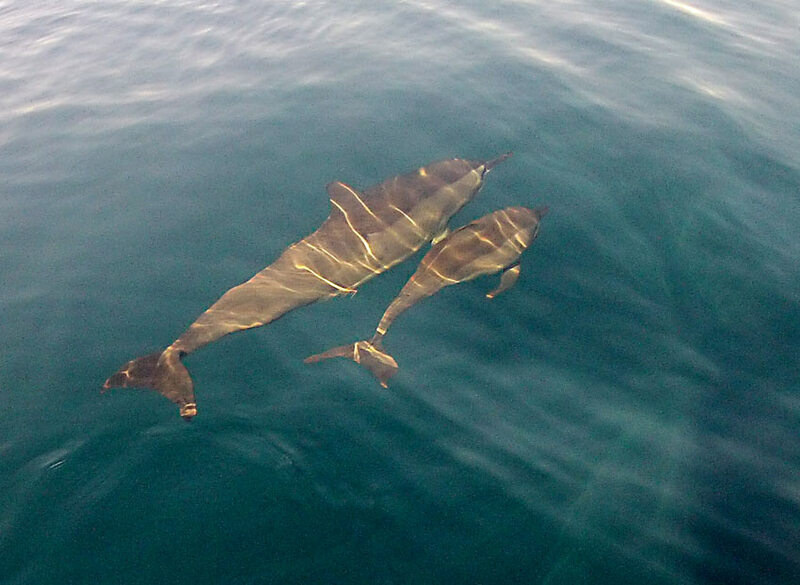 Ghostly image of the dolphins under the water beside our boat.. This is what it looked like when the dolphins would disappear from our view above board on the boat. This is what they did when out of sight; dive, dive, dive. Only to come back up a few meters away and then. 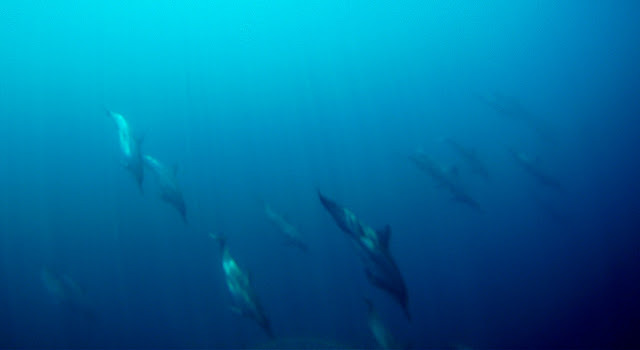 This day there we at least 100 in this school of spinner dolphins. A GoPro Hero cam, set to go off every 1 second, attached to a metal pole beneath the water. We had to delete a lot of Dave's nose as he went to turn off the auto shoot. 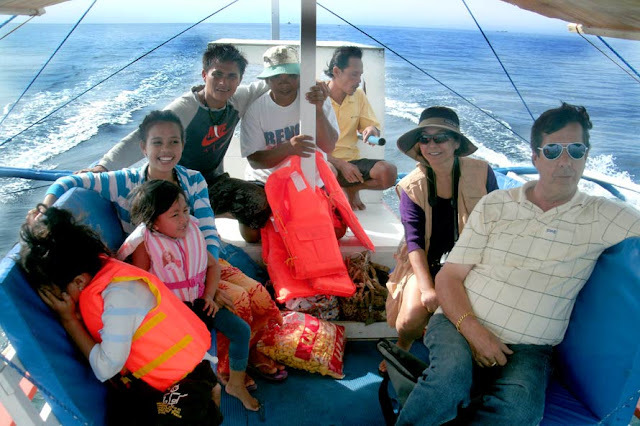 Here we are with our crew in the back, after the experience heading back to Turtle Bay where we park our bangka. That's me in the hat and Dave in front of me. This is an unfinished resort we see every time we go out on the boat across the cove in Turtle bay. 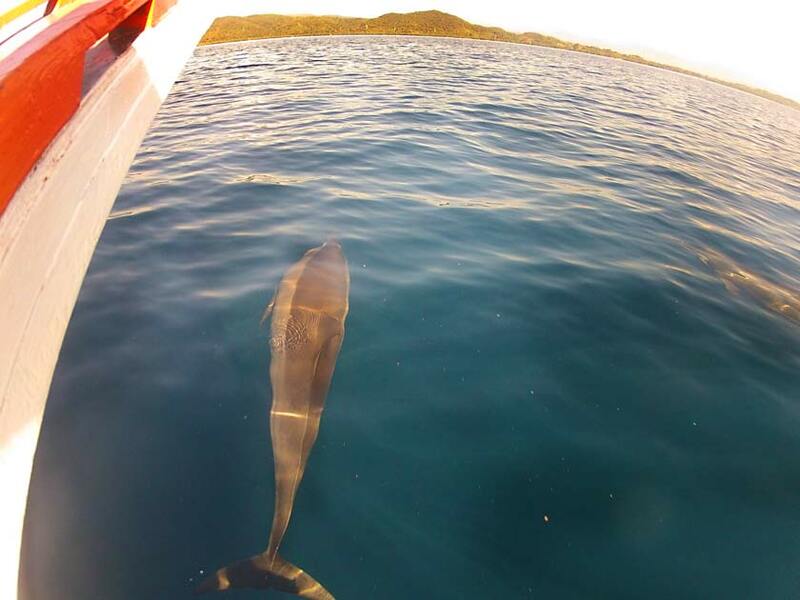 Our bangka, Laika, which Dave bought for us to be able to enjoy the waters around us and experience the sea creatures and clear waters in the area. 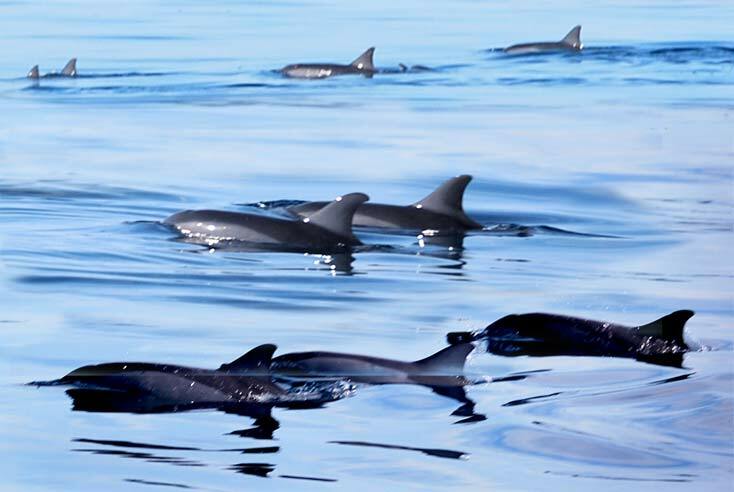 I read somewhere that the dolphin watching season begins here in June, but this was August when we first spotted them. We saw just as many again in early September as well. One has to be careful this time of year because the Habagat (southwesterly winds come up around 11 am). 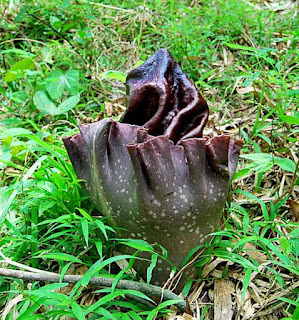 There are tours you can buy at most of the tour guide agencies in town and they will have the schedule. 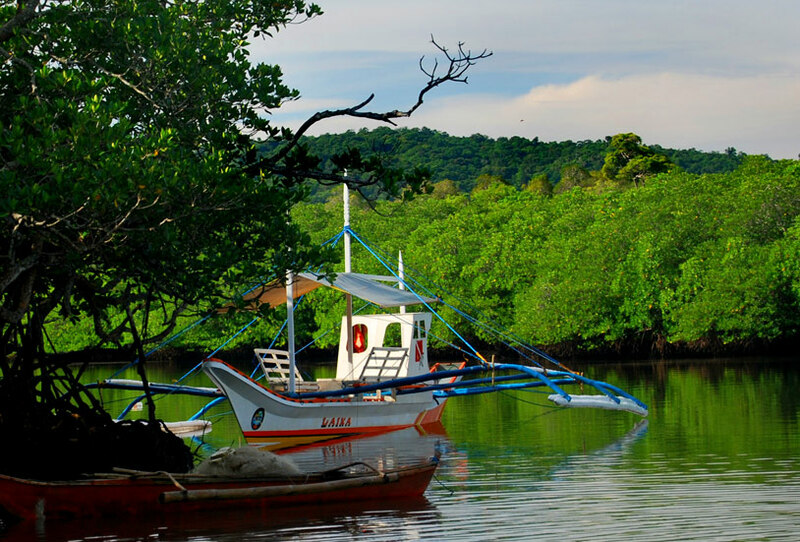 We are lucky we can go out anytime we want since we now have our own bangka. It's best to leave very early in the morning when the seas are calm. Here are some other links about the spinner dolphins in Puerto Princesa, Palawan. A video on YouTube, not the greatest but it shows how clear the water is and how close the dolphins get. Hi, thanks for dropping by. Is that your resort across our cove in Turtle bay? I love it...when will it open? We will be your best customers if you open a restaurant and we always have guests to put up!! !